Isha is my seven-year old hellion. However, Isha is exploring the depth of conflicting emotions. Wanting something that is harmful. Because it tastes good. And she’s taking it out on me. Like today. She picked up a handful of individually wrapped mints at Harbour Air’s counter. They are in a bowl for the taking. I think she grabbed as many as she could stuff in her little fist. I was busy checking in and I didn’t see her although I did notice that she was eyeing them. She growled at me and threw that candy at my head. And immediately hid her face in shame, in frustration. “You made me feel bad,” she sobbed. I leaned across the awkward tight space (any of you ever flown in a full Twin Otter?) and rubbed her back til she calmed down. It’s not my fault that GMOs are allowed here in Canada, unlabelled. It’s not her fault. It’s not the fault of Harbour Air who are offering slow-acting poisons. Gleefully and proudly. How should they know differently? Poor Isha. Poor moms. How can anyone know what they’re eating if it’s not labelled? It’s not fair. 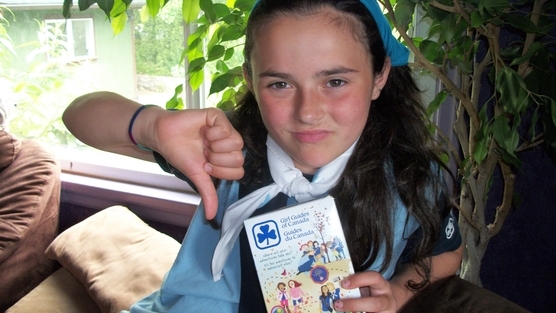 Girl guides petitions cookie makers to remove GMOs from their ingredients. Sign it here! The same corporations who oppose labelling here in N. America were forced to label in 64 other countries including Europe China and Russia. They are blocking efforts in Washington State as I write this. Biotech companies and the Grocery Manufacturers Association have put in over 17 million dollars to block GMO labelling. This is the most amount of money ever poured into a political campaign by out of state corporations. They are trying to drown out the truth with deceptive and false advertising. They won’t. Because the truth is spreading like wildfire. Mexico just yesterday banned GMO corn! It’s just a matter of time til everybody understands that GMOs are untested, use more pesticides and herbicides, are outperformed in the long-run by organic, and are unethical. 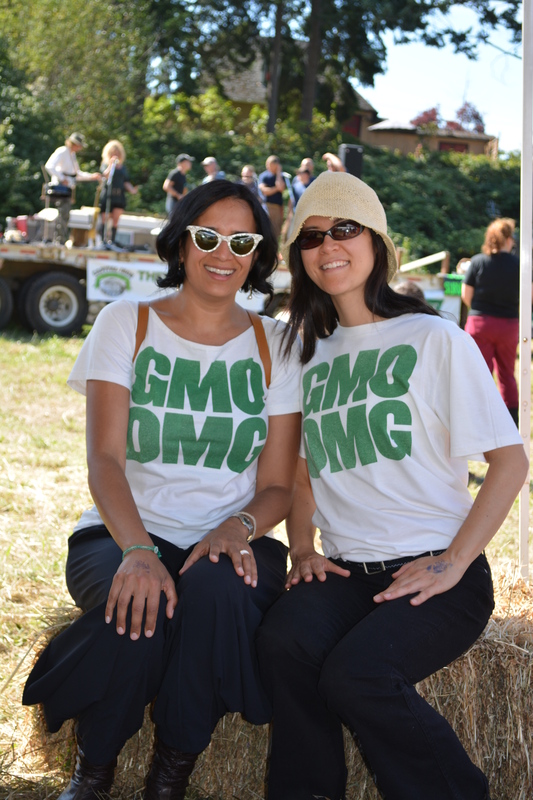 To contribute to Washington’s YES on 522 campaign to label GMOs – who can oppose the right to know – apart from unethical corporations? The vote is November 5th. Visit http://yeson522.com There are many ways you can contribute! This entry was posted in Farmland Conservation, Mobilize and March, Organic, Right to Know and tagged Genetically modified food, Genetically modified organism, GMO candy, GMO sugar, GMOs, Harbour Air, Washington, Yes on 522 on October 15, 2013 by Gurdeep Stephens. 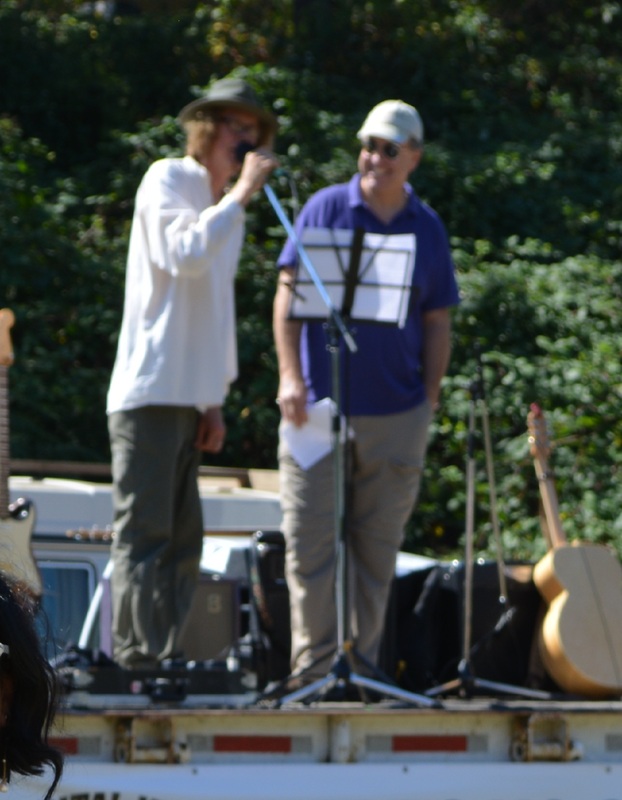 This entry was posted in Farmland Conservation, Food heros, Great Events, Mobilize and March, Organic, Right to Know, Sustainable Business, The Environment, The Triple Bottom Line, Trail-Blazers and tagged GE FREE BC, UBCM on September 19, 2013 by Gurdeep Stephens. It was my first Chef Survival Challenge. It was a hot day of watching Chefs alongside Firefighters get sweaty and dirty and labour and fight and cook for farmland conservation. 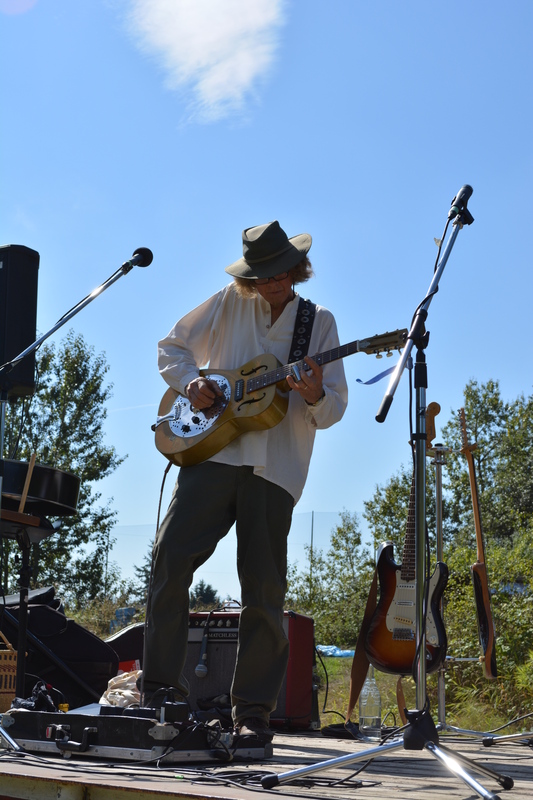 Let me set the stage with four time Juno award winner Lester Quitzau who played amazing guitar. Riffs and moods and skills. Big up respect. Wow. 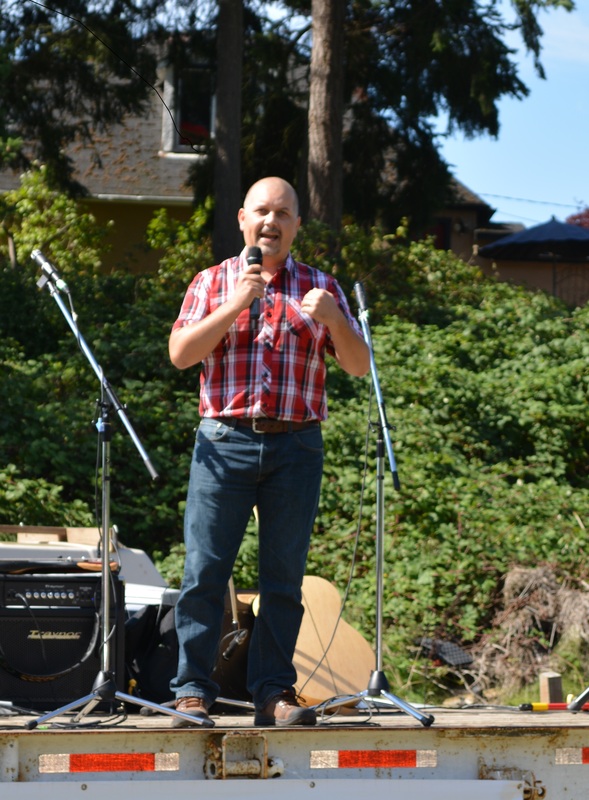 Adam Olsen, of the Tsartlip First Nation and interim leader of the BC Greens gave a welcome and blessing honouring the land. He spoke eloquently about the importance of local farms. Lovely Lola and Corey Francis sang a couple of songs in Lola’s stage debut. Proud mamma Nathalie below. 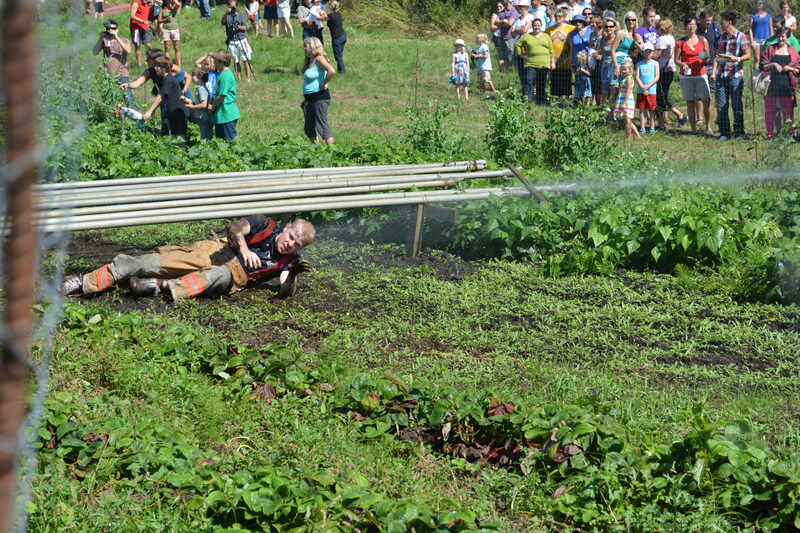 Then the Chefs and Fire-fighters were presented as contestants. In past years it was just chefs but this year the brawn was supplemented. Plus the local fire-fighters were honoured for…being heroes. In the photo below Madrona Farm’s Nathalie and Dave Chambers point out the obstacles to be overcome in the photo below. Nathalie and Dave are also heroes. They got 3000 people chip in and they donated their family farm to a land trust. How many folks do you know do that? They wanted their farm to be preserved forever and given to the community after their turn. Nathalie and Dave show how it can be done on Madrona Farm. 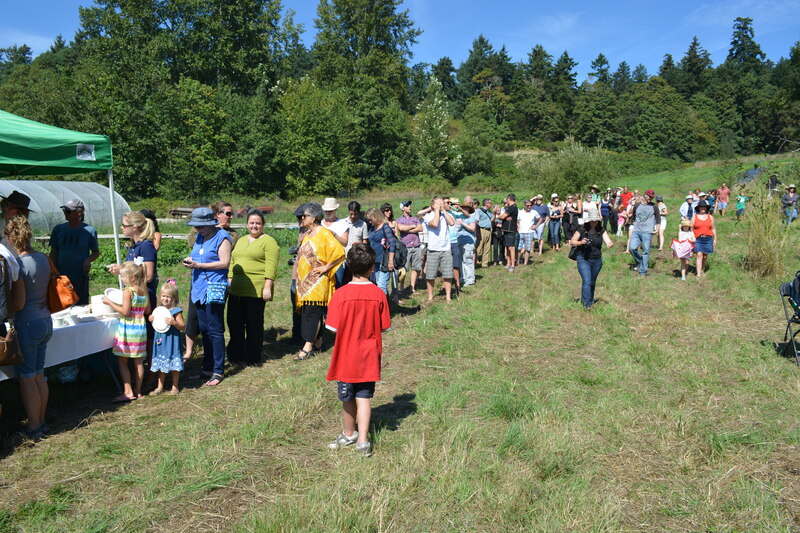 It’s Nathalie’s dream for all farmland to be owned by the community. 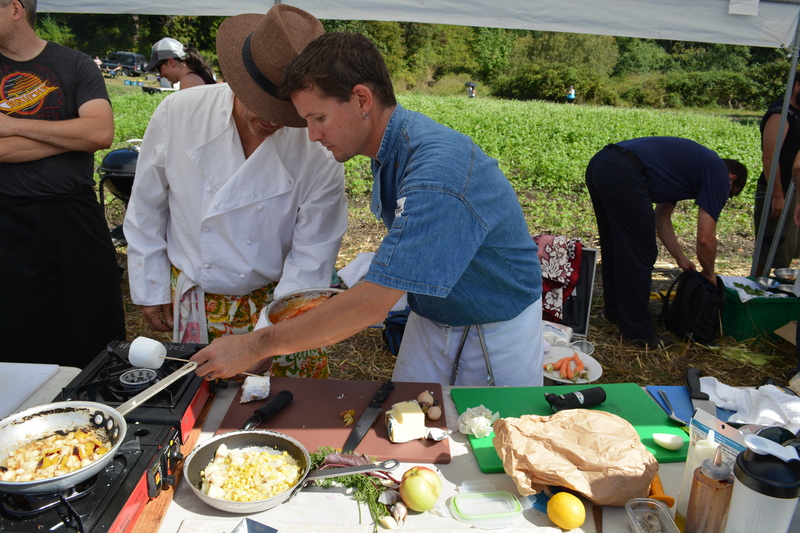 The Chef Survival Challenge is about raising funds for communities to purchase farmland (Big Dream Farm-fund) and farm it sustainably. No GMOs or pesticides, herbicide toxins. 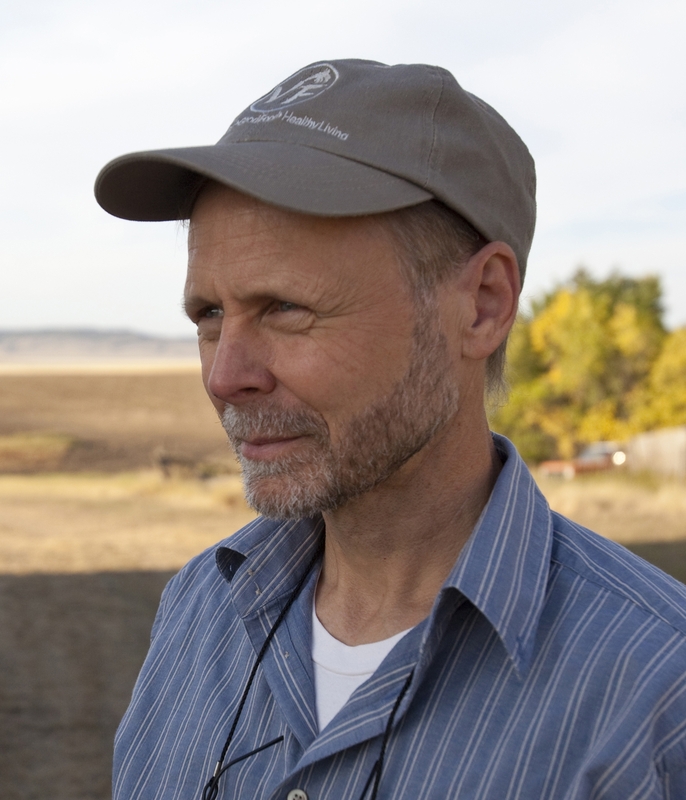 Farmland to be preserved in perpetuity for the community via land trusts. 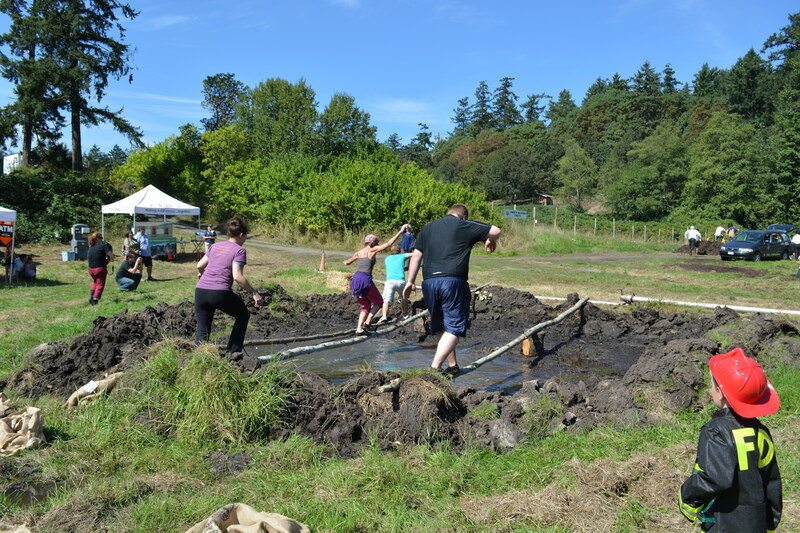 They soon got muddied in the mud pit…. And then had to crawl under nigh-impossible obstacles while being hosed by malicious gremlins. (Children). Look at the metal pipes. They are heavy. Look at them being displaced. Now look at the lower left corner. Are you squirming? From down low and dirty to up high and mighty. After the chefs were exhausted, tired, and cotto (means cooked in Italian)… they had to cook up a storm. The firefighters proving their might, stood around and looked strong. 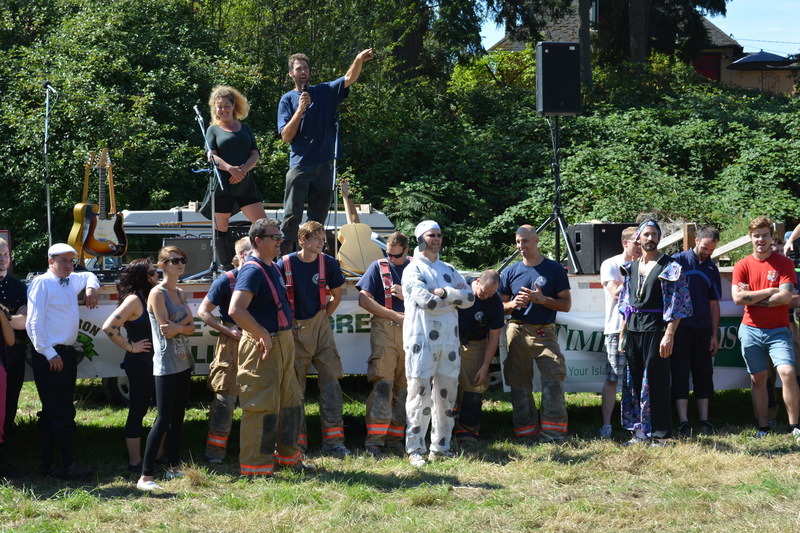 There was a live auction which raised $100 for an individual to be carried by a firefighter across the mud hole. Sadly I didn’t get a picture of that but suffice it to say that it was hot. Okay. The firefighter took off his shirt. And he was ripped. Did I mention that it was hot? 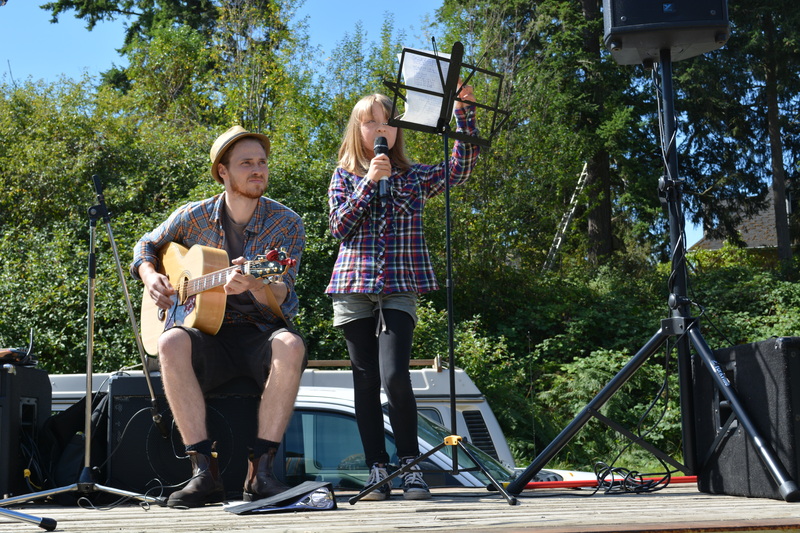 I sang Grandpa Rupert’s Song “This Earth is Ours” along with pianist Lisa Olive. Lisa is an amazing talent, a little technically challenged with a non-fully functioning half-length keyboard. Despite said technical difficulties and false starts when Colin the sound guy ran up to the stage waving for us to stop and support from Lester Quitzau himself, Lisa played with the flair of Chopin. The victuals were beautifully, locally sourced. The CRD was there with their water truck eliminating the need for single-use plastic bottles (KUDOS). Here is the line up for the food. Well worth the wait. Lots of vegetarian and vegan food I’m pleased to report. I met Kelsey from Innotech Nutrition with his ‘bro’. Out from from Winnipeg for a few days, he came to Chef Survival Challenge coz he heard that this was the best partay happening in Victoria. Dude got that right! Andrew Weaver spoke below, introduced by Lester Quitzau (sorry for quality of the photo). Andrew mentioned how his kids got him a playmobil farm set since he loves farms that much. We love that he loves farms. Hmmm. I wonder if he has a Green thumb? Chefs cook-cook-cooking away on camping gear. Don’t let that fool you for a minute! This was big-up gourmet: Note the care with which the marshmallow was roasted. The chefs auctioned off gourmet meals to the highest bidders. Sadly I couldn’t stay longer. 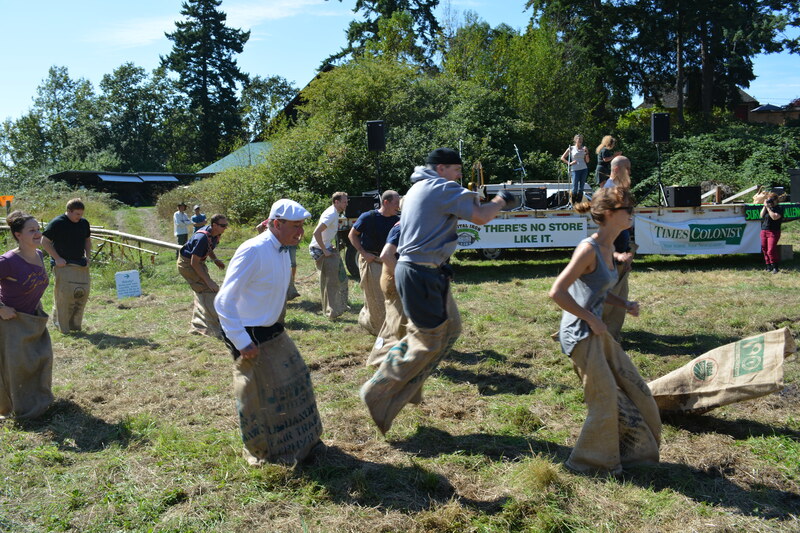 As I left the burlap sacks in the dust, the music on hiatus, happy community bonding underway with an auction frenzy…. I noted that the mud hole was being well-utilized. Every adult was holding the leash tight on their inner child. Fighting the urge to get really super dirty. This entry was posted in Farmland Conservation, Food heros, Great Events, Sustainable Business, The Environment, The Triple Bottom Line, Trail-Blazers and tagged Andrew Weaver, Barry Olsen, Big Dream Farm Fund, Chef, Chef Survival Challenge, Corey Francis, Dave Chambers, David chambers, Firefighter, Innotech Nutrition, Lester Quitzau, Lisa Olive, Nathalie Chambers, This Earth is Ours, Tsartlip First Nation on September 10, 2013 by Gurdeep Stephens. The ties that draw back to community, that revolve around locally grown food are amazingly ritualistic and atavistic. Like dancing around a fire, it’s primal to delight in the offerings nature provides. We lived in Italy for 6 years in the hills of Tuscany and Florence. When we first arrived, we were curious about several signs regularly posted throughout the year like “Sagra del Chianina” “Sagra del porchetta”, “Sagra del vino chianti.” What on Earth were these Sagra all about? 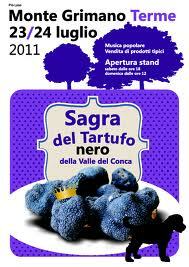 Sagra comes from the religious connotation of feast or celebration. It has been diluted to mean festival, feast. Sagra di Fungi Porcini was a common one. 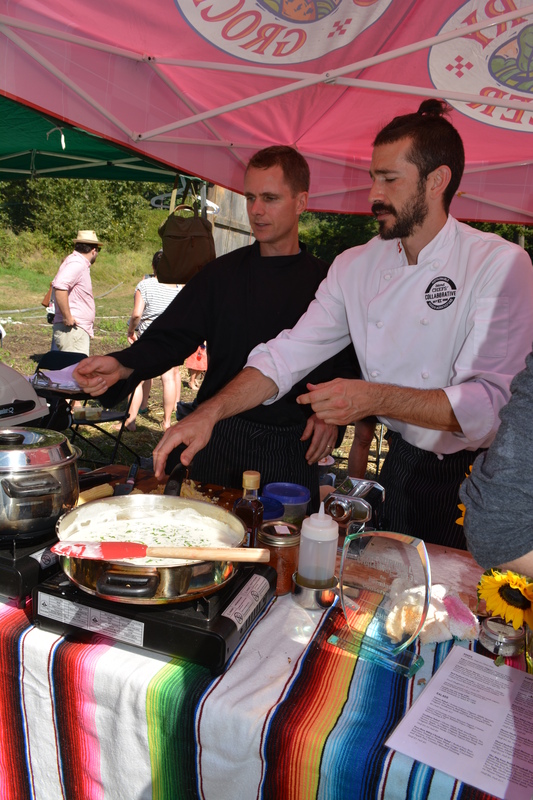 The Sagra brings community together in an informal celebration of local food. 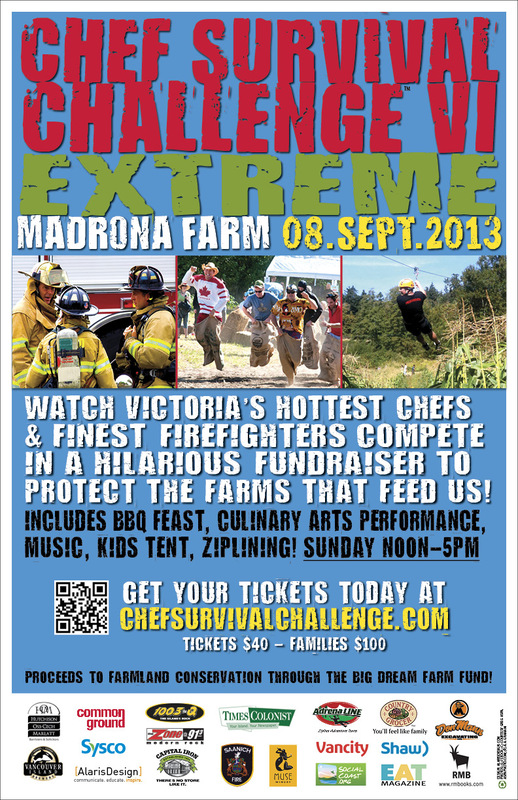 Chef Survival Challenge in Victoria is a tradition similar to the Sagra but more entertaining. There will be obstacle courses, a cooking competition by local top chefs, food foraging by said local top chefs who pick food that they cook. Local celebrities will attended. Andrew Weaver is scheduled to speak. I have been asked to sing This Earth is Mine! The vegetables fruits, berries and mushrooms from Madrona farm are sustainably grown; Nathalie is a passionate advocate for Bees and Biodiversity. This event is to support Nathalie’s Chamber’s Big Dream Farm Fund and Farmland Conservation. I can’t think of a worthier cause to support – whilst having fun – I’ve been looking forward to this for months! I will report back after the next Style-Diet Shot. This entry was posted in Farmland Conservation, Food heros, Great Events, Sustainable Business, The Environment and tagged Andrew Weaver, Big Dream Farm Fund, Biodiversity, Farmland Conservation, Iron Chef, Italy, Local food, Madrona Farm, Nathalie Chambers, Sagra, Victoria on September 7, 2013 by Gurdeep Stephens. Nathalie Chambers is an infectiously positive person. She is the only person I know of who has raised 2.7 million dollars in order to save her family farm and then turned around and gifted that farm to the community via a Land trust. What a bright, shining example of glorious possibilities. Thanks to Nathalie, this land will belong to the community. Forever. Food security is a pressing problem. Here is how Nathalie described it to me “Imagine the world as an apple, take 3/4 of that away for the oceans. We’re left now with 1/4 of that apple. That’s land. Now take the thin little peel on this remaining quarter slice of apple. This piece of peel is how much land we have for agriculture”. Nathalie Chambers at Madrona Farm. 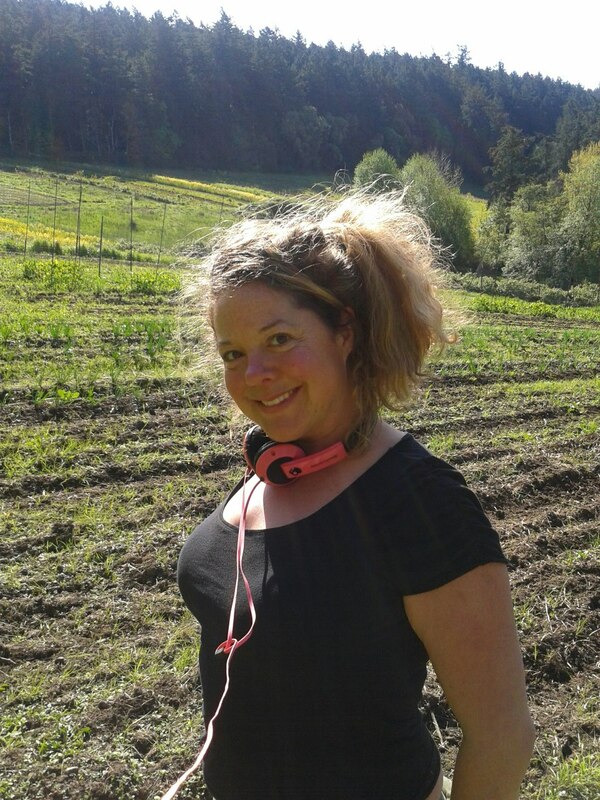 She farms sustainably with her husband Dave. Most concerned about preserving and enhancing biodiversity, Dave has engineered a light plough a couple inches shorter than standard so that it doesn’t disturb the local bees who hibernate in the ground over winter. 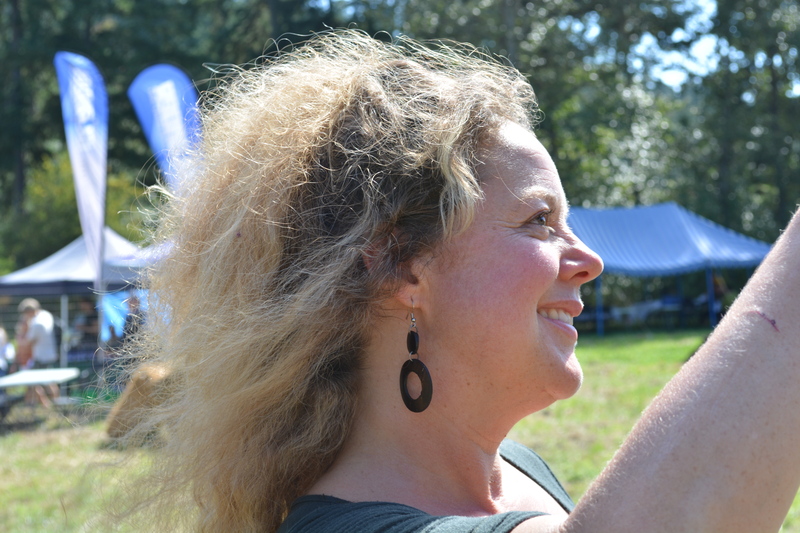 Nathalie has studied the trees on her farm and has found out that they enhance biodiversity since that’s where the pollinators thrive. When we lived in England, we joined the National Trust. This is a beautiful system by which the people collectively buy and protect historical sites, land and wildlife. People give as much as they can afford. It’s a delightfully democratic system with integrity. The British have much to protect. I think that Canada, given our sheer size, has way more. Inspired by the UK Trust, Nathalie has a similar vision for Canada – and the World!- called the Big Dream Farm Fund. http://chefsurvivalchallenge.com/the_big_dream_farm_fund.html Last night she unveiled her new National Vision tonight at the Vista 18 restaurant at the Chateaux Victoria. So many people would love to farm but can’t afford to buy the land. If the community can unite to protect and own the land, then farming can be accessible to those who want to. Nathalie and her husband Dave are a fine example demonstrating that it’s possible to make a living farming sustainably. What if every Canadian contributed just 10 dollars to preserving farmland – our glorious patrimony? Owning our farmland collectively, protecting it from land-grabbing speculators and big biotech companies who want to poison the soils and water with GMO Biofuel production (which is unsustainable, taking far more energy to produce that what it yields) or GMO food production which is highly unsustainable and scary in it’s misled monocrop vision. Monsanto claims to be feeding the world. What they don’t tell you is that 70% of GMOs are not intended for human consumption! Feeding the world, as they say over and over again – Bah Humbug. They’ve said it so many times that people believe them. Believe me -the Emperor is naked. 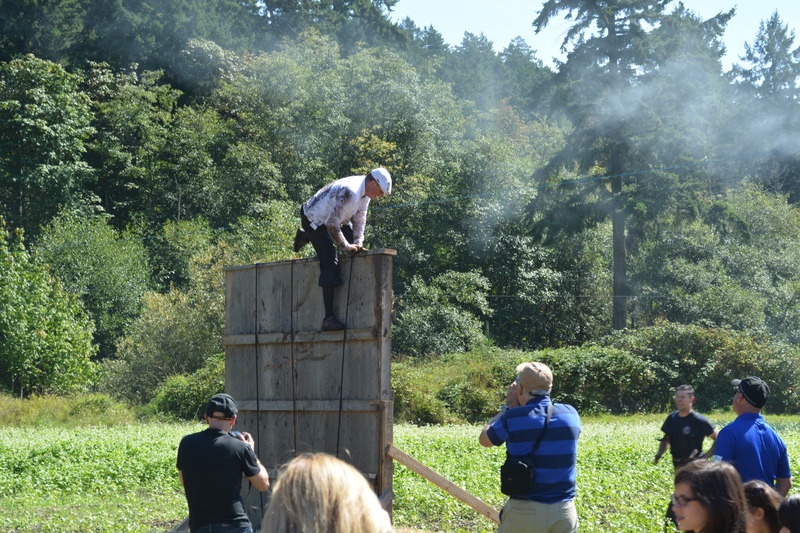 Chefs running an obstacle course at the 2009 Chef Survival Challenge at Madrona Farm. 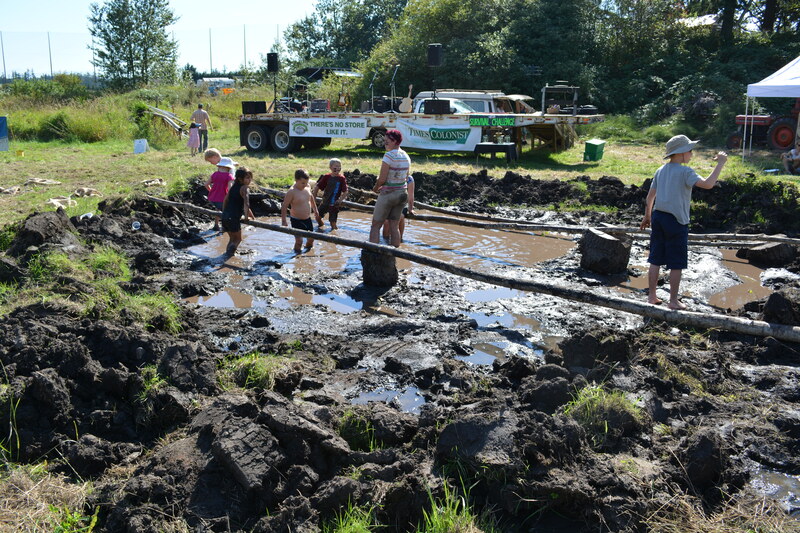 The Challenge both builds community and raises funds for farmland conservation. By committing to preserve farmland for sustainable agriculture, we can enhance our biodiversity, keep our water and soils pure and help supply the ever-increasing demand for organic foods (Organic means GMO free. Organic has never allowed GMOs). Nathalie has two upcoming events in September called the “Chef Survival Challenge” which brings together local chefs and local farms. 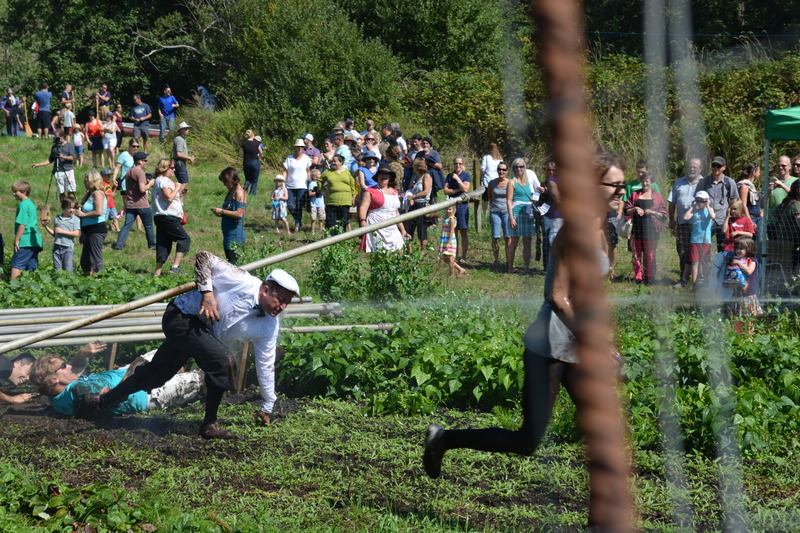 Well-known chefs race and swim and do all sorts of difficult and goofy obstacles before getting to pick their veggies and cook them into a 3 star dish which is judged. The winning chef becomes the year’s Golden Broccoli winner. Applause please. 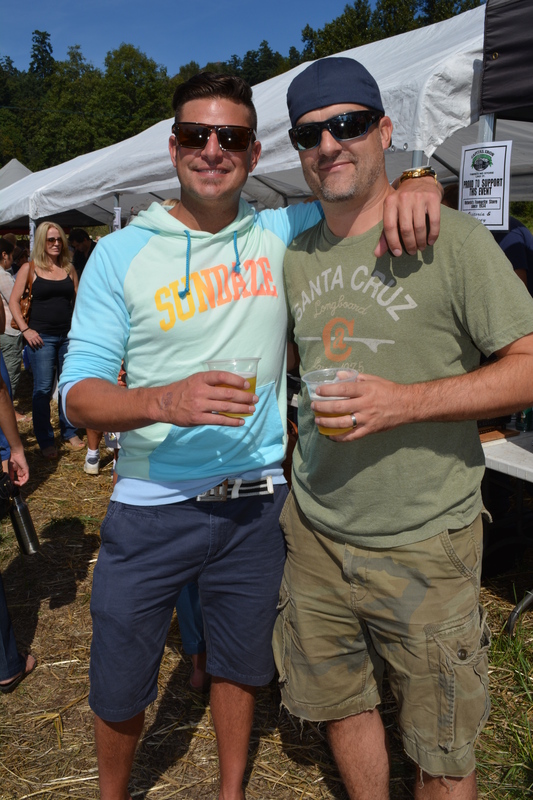 Funds raised from this fabulous community affair go right into the Big Dream Farm Fund. Raucous cheering! This entry was posted in Farmland Conservation, Food heros, Organic, The Environment and tagged Big Dream Farm Fund, Biodiversity, biofuel, Chef Survival Challenge, Farmer's Anthem, GMOs unsustainable, Goldstream Berry Paradise, Nathalie Chambers, Organic, Organic agriculture, This Earth is Ours on May 31, 2013 by Gurdeep Stephens.